Orbital Sciences Corp. is revamping its Taurus rocket with expertise and technology from the company's Minotaur launcher to deliver six high-resolution Earth observation satellites to orbit for start-up Skybox Imaging in late 2015. File photo of a Taurus rocket launch. Photo credit: Orbital Sciences Corp. The contract announced Thursday covers the launch of six satellites from Vandenberg Air Force Base on California's Central Coast. The spacecraft will be manufactured by Space Systems/Loral of Palo Alto, Calif., in a separate contract revealed Feb. 10. Orbital Sciences said the six payloads would launch on a commercial variant of the Minotaur rocket, which has launched 25 times since 2000 on suborbital and orbital missions for the U.S. government. Minotaur rockets are typically powered by a mix of decommissioned government-furnished ballistic missile motors and commercial stages derived from the air-launched Pegasus launcher and the Taurus rocket, Orbital's two commercial launch vehicles. The Minotaur 1 satellite launcher's first and second stages come from the U.S. Air Force's stockpile of Minuteman missiles, and the Minotaur 4 family is based on larger rockets from the military's Peacekeeper system. But U.S. law prohibits using the existing Minuteman and Peacekeeper motors for commercial satellite launches. Engineers plan to replace the government motors with the same commercial solid-fueled rocket motors flown on Orbital's Taurus rocket, which last flew in 2011. The last two Taurus missions failed to put NASA climate research satellites into orbit. Investigators blamed the back-to-back launch failures in 2009 and 2011 on problems jettisoning the Taurus rocket's payload fairing, an aerodynamic shroud covering the satellites during the first few minutes of flight through the lower atmosphere. The extra weight of the fairing on both missions meant the rocket could not attain enough speed to reach orbit. The commercial version of the Minotaur rocket tapped to launch the Skybox Imaging satellites will "look a lot like" the Taurus rocket from the outside, according to a senior Orbital official. "It turns out to be the same propulsion stack as the Taurus rocket ... with lots of common other technology from Minotaur," said Barry Beneski, an Orbital spokesperson. "Also, it is the Minotaur engineering and launch team that is developing, testing and will be launching the rocket." The first stage will be powered by a Castor 120 solid-fueled motor from ATK. 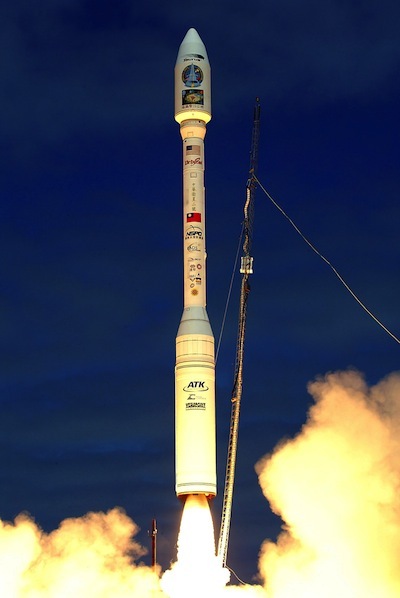 ATK-supplied upper stage Orion-class motors will boost the rocket into orbit. 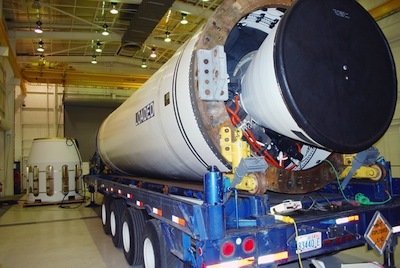 The commercial Minotaur, dubbed the Minotaur-C, will fly with a 92-inch-diameter fairing flown on the Minotaur 4 and Minotaur 5 rockets. The fairing that caused the 2009 and 2011 Taurus launch failures was a slimmer version with a diameter of 63 inches. Engineers are still finalizing the design of the Minotaur-C launcher, an Orbital official said, "but the plan is to use as much Minotaur avionics, ordnance, software, etc. as possible while capitalizing on existing designs from Pegasus and Taurus where it makes the most sense to keep technical risk low." The Minotaur-C rocket will likely launch from Space Launch Complex 576E at Vandenberg, the same facility used by the Taurus rocket. "We are very pleased to have been selected by Skybox Imaging for this exciting opportunity," said David Thompson, Orbital's chairman and CEO. "As fellow participants in the expansion of the commercial space industry, Orbital and Skybox share similar values of innovation, affordability and reliability, which make this partnership a perfect fit. We have offered options for additional launch services to support the development of Skybox's business, and we are looking forward to the opportunity to forge a long-term, multi-launch relationship with their team." The launcher will put the six 264-pound satellites into a sun-synchronous polar orbit about 300 miles above Earth. Orbital is developing a dispenser to release the six payloads once they are in orbit. The spacecraft are the first six of 13 satellites Skybox ordered from Space Systems/Loral. Skybox has not announced launch arrangements for the other seven satellites. Skybox says the satellites will have a top resolution of about 80 centimeters, or about 2.6 feet. The spacecraft will record high-definition video clips up to 90 seconds long at 30 frames per second, according to Silicon Valley-based Skybox Imaging. The satellites will grow Skybox's fleet of orbiting spacecraft to record high-resolution photos and video. The start-up company intends to offer imagery with rapid refresh to provide customers with more up-to-date views of cities, farms and industrial sites. Skybox Imaging's first satellite, SkySat 1, launched from southern Russia on a Dnepr rocket in November. Officials have already released video clips from the oven-sized spacecraft, showing unprecedented views of bustling cities, war-torn hotspots, mines and power plants. "With the successful launch of SkySat-1 in November 2013, we validated our high-performance imaging satellite design and economics," said Michael Trela, vice president of satellite systems at Skybox Imaging. "By partnering with SSL, we can leverage their unique production capabilities to scale with greater cost-efficiency and speed while allowing us to focus on prototyping next generation systems to better serve our customers." The SkySat 2 satellite will blast off aboard a Soyuz rocket from Kazakhstan in late 2014. The first two SkySats were designed and assembled in-house by Skybox, but the company has licensed the construction of follow-on satellites to Space Systems/Loral. Under an exclusive license, Loral can exploit the small satellite platform for other business, the company said in a press release. Once the 13 Loral-built satellites are all in orbit in 2016, Skybox says its fleet will be able to revisit any point on Earth three times per day. Space Systems/Loral is best known for building large commercial telecommunications satellites, but the company's purchase by Canada's MDA Corp. in 2012 expanded the firm's business into smaller spacecraft. "The contract award from Skybox is tangible evidence of our success in working with MDA to expand into new markets," said John Celli, president of Space/Systems Loral. "Based on SSL's unique strengths as a satellite manufacturer and MDA's heritage, we are developing new capabilities that will enable us to pursue other Earth observation and LEO satellite opportunities in the U.S. and abroad."